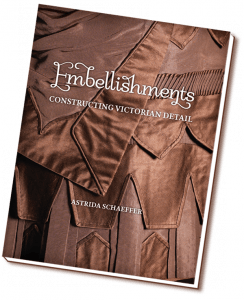 Review: Embellishments | Oh, The Glamourous Life! Buy your tickets to The Teaseday Club on July 9th in my name! I’ll do something nice for all my supporters! Inspired by an exhibit at the University of New Hampshire Museum, which she curated, Ms. Schaeffer presents a number of the elaborate Victorian gowns from the museum’s collection. The book focuses on 10 gowns, beautifully photographed, dating from the 1870’s to 1909. There are many close-up photos showing details of those gowns and others to illustrate the embellishment techniques used. So where’s the burlesque in all this? Ms. Shaeffer doesn’t only show the embellishments used, she explains how to do them! With clear instructions and diagrams she shows the reader ruching, pleats, ribbon work, binding, piping, cord & braid work, and appliqué. The possibilities for your own costumes are endless! There is more to embellishment than just rhinestones (shocking, I know…). I got my copy through Astrida’s Kickstarter campaign, but you can buy yours direct from the author at ShaefferArts. And if you ever need a custom mannequin, she’s your gal!